One of the best safety tips for hydraulics is the encouragement to learn as much as you can about the safe use of hydraulic hoses and hydraulic fluid. The injuries that can come as the result of a failure can be very serious and even deadly, so it pays to do everything you can to establish a safe schedule for regular hydraulic hose replacement. Make sure that you replace old, worn out hoses with the right size and type of hydraulic hose assembly. This is definitely not one of those situations where one-size-fits-all. At Metro Industrial & Marine Supply, we offer a wide array of options for custom “while you wait” builds for hydraulic hose assembly at our New Bedford location. We have a large stock of products and components that are in demand, but we take pride in the ability of our technicians to create top quality hydraulic hose replacement for same-day service. Our team has capabilities for building custom hoses like no other shop in the local area, and we take pride in being able to meet or exceed expectations every day. We get a lot of customers who ask us when they should be replacing their hydraulic hose assembly for optimal safety. Unfortunately, there is no easy answer. Hose assemblies and the seals that are used on the hose fittings and adapters can age, wear out, harden and deteriorate faster or slower, depending on their use. Thermal cycling and compression increase the wear and tear, so for safe use of hydraulic hoses, it is crucial to rely on visual inspections and testing. That being said, for prevention and safe use of hydraulic hoses, there are a few indicators that you can use to help you with replacements at specific intervals. It is important to note that even with visual inspections and testing, hydraulic hose replacement intervals help to ensure safety and reduce downtime, damage, and injury risk. Failure often happens without warning and can come from internal mechanical or chemical wear caused by the conveying fluid that cannot be seen during inspection. This is why it is important to keep a log of all failures, inspections, replacements, and other issues throughout the life of the equipment. The entire hydraulic system works through the use of high-pressure fluids that transfer energy to produce work. Every component is under pressure and subject to failure. 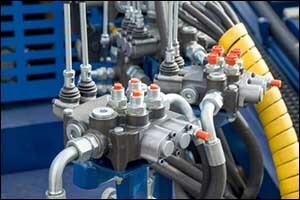 This includes all parts of the hydraulic hose assembly, fittings, and even the fluids themselves. Hydraulic fluid under pressure can be extremely dangerous, causing injury to workers and bystanders, as well as damage to equipment and other assets in the vicinity. Safety tips for hydraulics often include safe handling, preventive measures, and warnings about being cautious whenever working with hydraulic equipment. Hydraulic hose replacement is important to prevent failures caused by abuse, wear, misapplication, and neglect concerning regular maintenance. In most situations, a failure results in pressurized fluids leaving the hydraulic hose assembly in a stream that is sometimes so small and fine that the user cannot even see it. However, exposure to highly pressurized fluids in this manner can result in skin penetrations which can lead to severe tissue damage, loss of limbs, and even death. This is why inspections and troubleshooting should not include feeling around the hoses or any other part of the assembly for leaks. Safe methods should be used to check for leaks when they are suspected or during regular inspections. Even if you feel that your exposure to hydraulic fluids was minor, it must be treated immediately by a physician who is experienced in dealing with hydraulic fluid injuries. If you are in need of custom hose assemblies for hydraulic hose replacement, make sure to stop by Metro Industrial & Marine Supply in New Bedford. We are proud to have many customers in the Greater Fall River area and throughout Southeastern Massachusetts and Rhode Island. Our team can assist you with custom “while you wait” builds or provide you with stocked parts and components for all of your hydraulic equipment needs. Give us a call at 508-996-8400 to speak with one of our technicians about your needs or visit our shop on Coggeshall Street in New Bedford, MA.